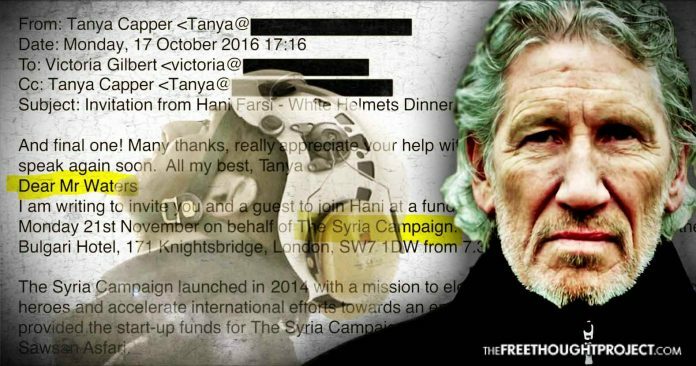 Pink Floyd's Roger Waters revealed that he was one of many celebrities who has been approached by a group working with the White Helmets and asked to participate in their propaganda campaign. Earlier this week, The Free Thought Project reported that Pink Floyd frontman Roger Waters stopped a concert in Barcelona to warn the crowd about pro-war propaganda that is coming from a group in Syria known as the White Helmets. In the days since Waters has taken several interviews to further explain his views, the most interesting of which was with a group called the Grayzone Project, where exclusive emails were featured, showing conversations between Waters’ team and representatives of the White Helmets. The Syria Campaign is a subsidiary of the New York-based PR agency Purpose, which claims to be impartial in the Syrian civil war. But as Alternet reported, they are on a mission to provoke western intervention in the region and have even openly called for a no-fly zone. The Syria Campaign works very closely with the White Helmets and likely has many of the same members. Last year, the Syria Campaign paid actors up to $600 each to participate in a pro-White Helmet flash mob and orchestral performance at New York City’s Grand Central Station. The White Helmets were founded in Turkey by a former British MI5 officer named James Le Mesurier. The group has received at least $55 million from the UK government and an additional $23 million from the U.S. government, both of whom have regime change interests in the region. According to data agency Gov Tribe, the U.S. government has given at least $339.6 million in foreign aid to groups attempting to bring about a “transition” in Syria. The “transition” that the White Helmets and affiliated groups are hoping to bring in Syria is far from peaceful and well-intentioned. Members of the WH have been filmed and photographed standing and celebrating with Al-Qaeda-affiliated terrorists after battles, helping to conduct public executions, and they were even caught carrying around headless bodies. The Syria Campaign has attempted to cover up these atrocities by dismissing video evidence as “Russian propaganda,” a familiar excuse that has been parroted by government representatives in the U.S. and the UK. The event that Waters was invited to in 2016 was officially sponsored by one of Farsi’s holding companies, called the Corniche Group. Waters said he did his research and was suspicious of the motives that these interests had, so he never responded and avoided getting involved in those efforts. Instead, Waters did his own research on what was going on in Syria and used his platform to speak out against U.S. intervention. Unfortunately, a handful of other celebrities did take the bait and signed on to publicly support the White Helmets and the Syria Campaign. These names include George Clooney, Ben Affleck, Daniel Craig, Justin Timberlake, Aziz Ansari and Zoe Saldana. As I reported earlier this week, Waters did not give this man his requested time onstage but instead addressed the audience himself with a message of peace and non-intervention. These e-mails give a behind the scenes look at how pro-war PR firms attempt to harness the power of celebrity to promote political ideas that these celebrities often know very little about. These agencies are depending on busy artists or musicians to take them at their word in regards to life and death political issues, but luckily at least a few of them seem to be doing their research.